The American Dental Association (ADA) has officially chosen February to be the month for recognizing children’s dental health. The purpose of this month-long event is to spread awareness of oral health to today’s youth so that they may be orally healthy adults in the future. How Can You Get Your Children Involved? Is It Ever Too Soon to Start? You may wonder how you can involve your own children if they seem to you to be too young to appreciate the meaning of Children Dental Health Month. What you need to know is that it really is never too soon to start teaching your children good oral health habits. Even babies who are teething could benefit from a good gum rub-down, for reasons of both comfort and cleanliness. Studies show that by the time your little one turns a year old, it is advantageous to have already scheduled that first dental appointment. Statistically, one in four children has dental decay by the time they enter school, and children who have dental decay in their baby teeth are much more likely to be adults with dental decay. As you well know, your children’s oral health is an integral part of their overall health and well being, and good (or bad) oral habits now will continue into adulthood. 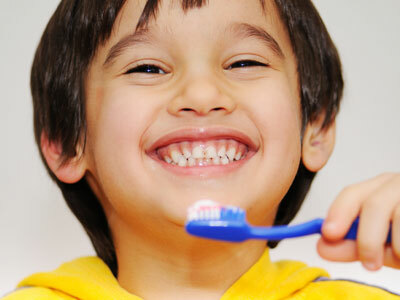 Do your part to ensure your children’s future dental health by observing Children’s Dental Health Month this February. About the Author: Ernie Farran has 3 small children and also partners with a chain of dental offices to do tech jobs. He loves taking his kids to offices that cater to the needs of children. His favorite office does a dental cleaning day for kids with face painting, games, and activities to reduce stress in the office.